There’s a rule of thumb in the wonderful world of mountaineering that when the opportunity to have a shower arises, it’s best to take it as you never know when and where your next shower will be. 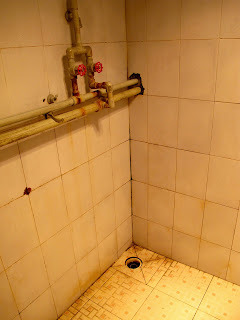 Unfortunately the water coming out of the communal shower in the Snowland Hotel was so ice cold that one could only presume that there was a direct line to some sort of glacier outside of town or, perhaps it was used as a form of Chinese water torture. Traditionally, Tibetans only shower 3 times in their lives – when they are born, when they are married and when they die. Given the absolutely Baltic nature of the water it wasn’t surprising. When you’re bored and desperate you can be driven to situations you’d ordinarily not find yourself in – one of the reasons why I love expeditions. 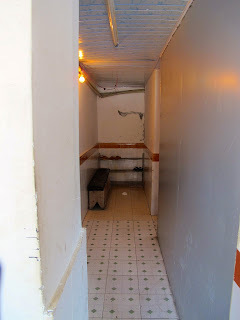 So, it was with a large dose of curiosity and small dose of trepidation that I ventured into an old, dirty-storefront in Downtown Nylam following a sign which advertised ‘HOT shower, massage, coffee, tea’. I was greeted by a gruff-looking shop manager sat alone smoking a cigarette watching a grainy Chinese television programme on full volume and sat beside a solitary heater. He grunted as I walked in and nervously asked about a ‘hot shower’ as advertised. By his reaction I suspected that I wasn’t the first Western tourist to enter the shop with a similar request as he immediately stood up, slightly perturbed that I’d disturbed the Chinese version of ‘The Young and the Restless’. I was led down a long dark corridor of stairs. The once white walls now grey-brown with mildew and dust. A completely rusted washing machine sat in the corner, open and looking like it had done a cycle or two too many. We turned left at the bottom of the stairs and led down yet another corridor of broken concrete stairs, this one even darker and dirtier than the last. A lone hair dryer lays in the corner – as if to remind you that you have in fact come to the right place. Finally, we turn left again into a tiled corridor. A filthy dripping mop sits in the corner next to a pile of old plastic flipflops. Realising that I had forgotten my ‘shower shoes’ I contemplated putting on a pair for all of about 2 seconds. 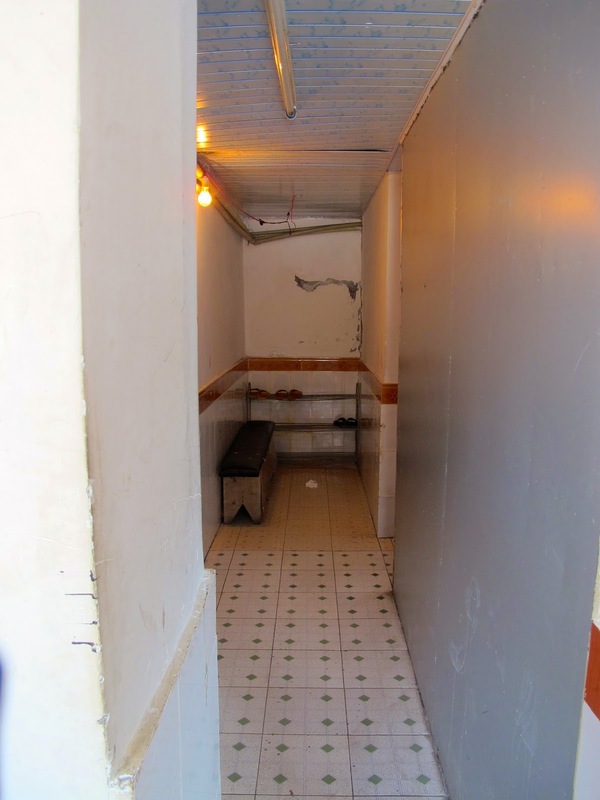 In a haze of cigarette smoke, I am led down a final corridor – this one of ‘shower rooms’, on either side of the walkway as indicated by giant wooden doors covered in what can only be described as ‘house siding’. The shop owner swings open a creaking rusted door, strides into the ‘shower room’ and stands under one of the two showerheads. Grunting, he cranks open the tap to unleash a stream of water which begins to pool at the bottom of his muddy shoes. The look on his face indicates it wasn’t quite as hot as he’d hoped it would be. I try and communicate asking if it’s ‘solar powered’. This attempt at communication was obviously a step too far. The shop keeper stares at me blankly as he continues to wait for the temperature to improve. I take the opportunity to survey my surroundings. Long strands of thick black hair have accumulated around the drain. Mud from my shoes and that of the shopkeepers has left muddy tracks into the shower room, three ‘stools’ occupy the room and a large rusted metal cupboard filled with newspaper sits against the wall. The roof is a mix of old Styrofoam and again, that house siding now brown with rust and mildew. The most modern part of the room was the light which seemed to radiate heat – or, as I worried, seriously harmful uv rays. Content that the temperature isn’t going to improve and keen to get rid of an increasingly nervous looking customer, the shopkeeper grunts, takes another drag of his cigarette and sticks out his remaining dry hand. I could only assume that it was for payment so I dig deep into my pockets and hand over the requested 40 yuan – equivalent to about $4 - a deal as long as there isn’t a follow up insurance claim to cover the medical costs. As he walks out, the shopkeeper indicates that the metal cupboard filled with newspaper is to house dry clothes during showering. I nod keen to complete the task that I’d set out to do. I can say with a strong degree of confidence that it wasn’t the most comfortable shower I’ve ever had and question whether I actually left cleaner than when I arrived… I spent most of the 5 – 7 minutes standing on my tippy-toes desperate not to put my flat feet on the filthy tiled ground (an exercise much harder than it sounds!). I danced around the long dark hairs and swirls of dirt that pooled around my feet. Having said that, it was ‘refreshing’ and I felt that I’d had a truly ‘cultural’ experience. An acrobatic dance of getting dressed without touching the ground and get my socks and shoes on as soon as possible soon followed. I pulled a comb through my wet hair, decided not to try my luck at the hairdryer I noticed earlier, dabbed on some strawberry lipgloss and headed back upstairs with a spring in my step. I managed to get a crooked smile and nod of approval from the shopkeeper as I headed back out into the cold, damp streets of Nylam. I wonder when my next shower will be?